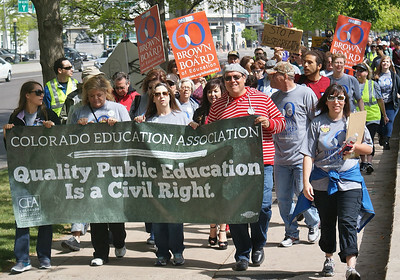 March in Denver, Colorado, sponsored by teachers union (Colorado Education Association) to commemorate the 60th anniversary of the US Supreme Court decision, Brown vs Board of Education. 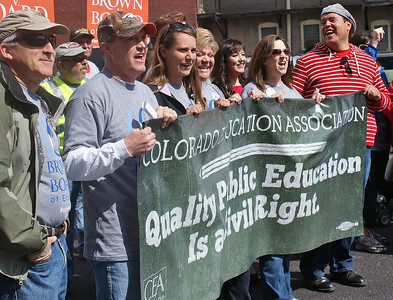 Marchers with public education banner, large number of marcher behind them. 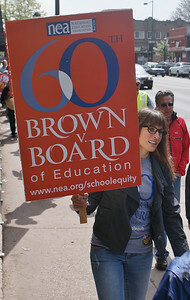 Woman marching with sign about Brown vs Board of Education anniversary. 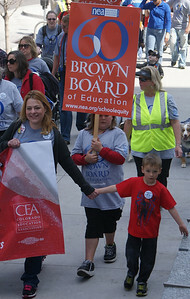 Mother and two children march with signs about public education. Woman raises fist in the air, many marchers behind her. 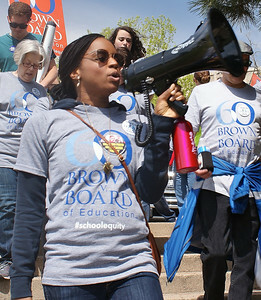 African-American woman with "Brown v Board" t-shirt speaks through megaphone, marchers behind her. 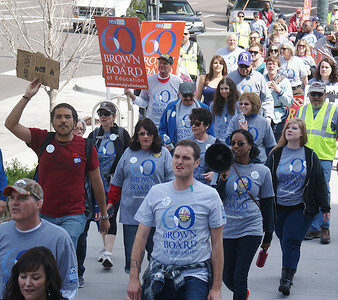 Line of marchers from above, many some with signs "Brown vs Board". 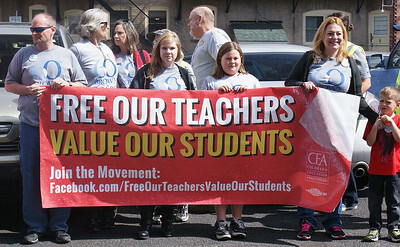 Teachers and children holding banner "Free Our Teachers", "Value Our Students". Young child in stroller, protest sign behind her. 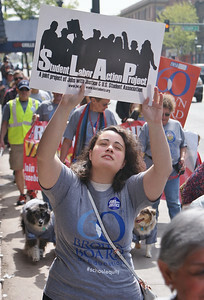 Young student raises "Student Labor Action Project" sign, other protesters march behind her. Father with son on shoulders, child in stroller beside them, other marchers behind them. 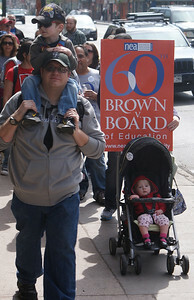 Woamn wearing "Brown v Board" t-shirt marches, carrying young son on her shoulders. 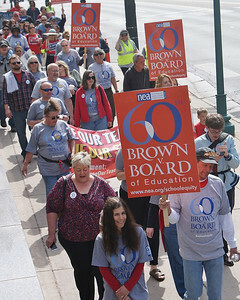 Young girl marches with "Brown v Board" sign. 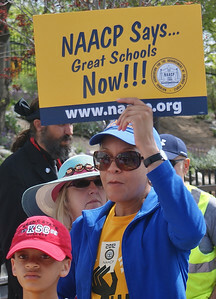 Woman with NAACP sign, young chils next to her. 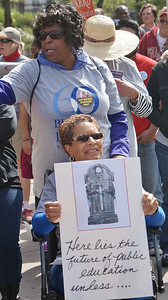 African-American woman in wheelchair holds sign about public education with tombstone on it, another woman pushing her wheelchair. 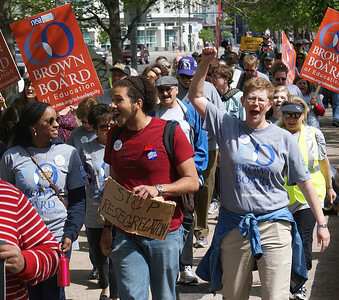 Large group of marcher with "Brown v Board" signs and t-shirts. 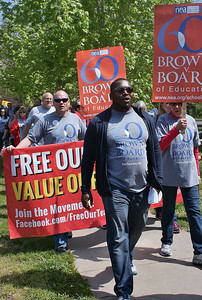 African-American man with sign and t-shirt about "Brown v Board", others marching behind. 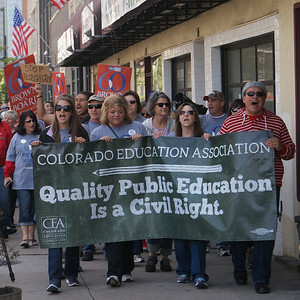 Marchers with public education banner, large number of marchers behind them. 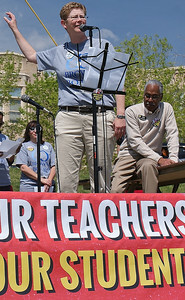 Woman gestures with arm whuile speaking into microphone, public education banner below her. 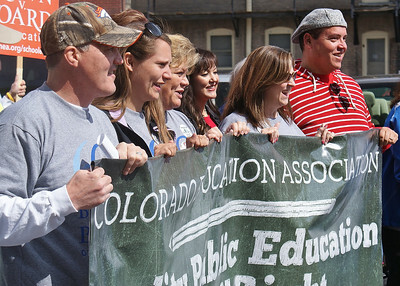 Group of teachers holding CEA banner about public education. 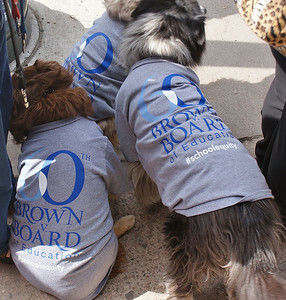 Three dogs wearing t-shirts about "Brown vs Board Of Education" anniversary.